Jewels – 21 ruby and sapphire jewels. Gold settings. Olive hole balance jewel. Plates – genuine nickel. Richly damaskeened. Pearl finish under dial and on under side of plates. Gilt lettering. Extra highly polished, cupped and beveled visible winding wheels. Recoil click. Dust band. Balance – chamfered and extra highly polished compensating balance with gold balance screws. Meantime screws. Breguet hair spring. Self-locating hair spring stud. Micrometer nut and screw anti-backslash regulator. 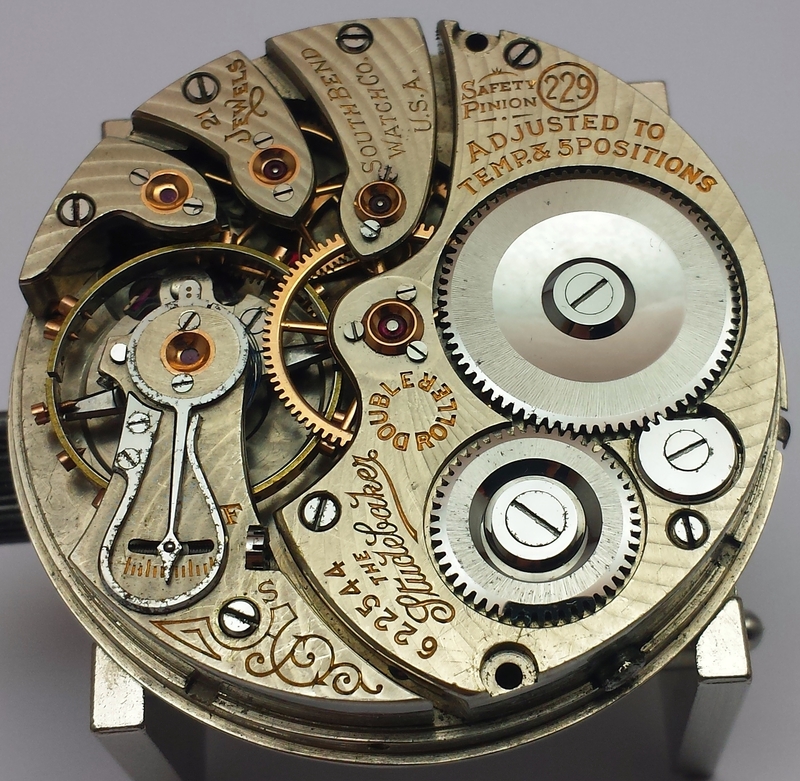 Escapement – double roller escapement. Cone pivoted and cap jeweled. Exposed synthetic ruby pallets. Sapphire jewel pin. Steel escape wheel, highly finished and beveled with all acting surfaces ground and polished. Tested on half time without hair spring. Adjustments – adjusted to temperature, five positions and isochronism. Most accurately rated. Dial – double sunk or fancy, or Montgomery numerical glass enamel, ground edge dial. Finish – cornered screws throughout. Highly polished round arm gold center wheel and train. Open Face. First run – 1909, last run – 1918. Total production 6000.